Soon it will start to get cold outside and the snow will fly here. This is one of the joys of living in a northern climate and having very distinctive change of seasons. Throughout the late fall, winter, and early spring, work in the shop will become more intense and regular. In general, summertime activities tend to become a good distraction from car building or working in the shop. Attending summertime car events is a chance to chat with other car builders or enthusiasts. Ideas can be exchanged and possibly a new friendship is established. I find by the time summer is over, I am ready to work on the car with great amount of vigour with fresh number of new ideas percolating in my mind. The Waterdown Ontario Swap Meet & Car Show is always a great event to attend. This fall the car show and swap meet will be on September 24th & 25th 2010. 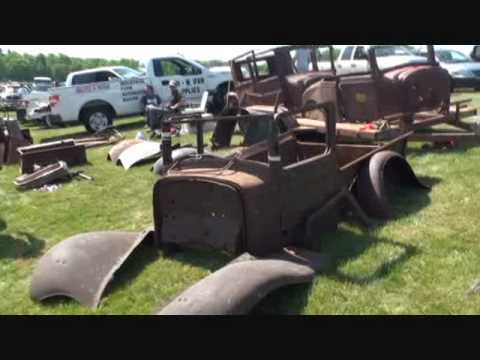 The swap meet and car show is located at: Joe Sams’ Park, 752 Center Road, Waterdown, Ontario. The link for more information on this event is: http://www.waterdownswapmeet.com/ . Let’s hope the weather will be good for this outdoor event. In the past, there have been well over 1000 cars on display and numerous vendors selling just about anything. Below are a few videos of the event we attended just last spring. This will give you an idea of what to expect if you can go. You will not be disappointed if you are close enough to attend. The first one shows me and my friend Jim driving his 37 Chev, arriving at the fair grounds and getting parked. The second video shows clips of the swap meet and car show. In the past there has been well over 1000 cars on display in the outdoor field. This is an event that should be considered and attended. Enjoy. Just click on the thumbnail to start watching the video. Last Saturday, my friends Jim and Bob from the Forest City Street Rods car club went on a road trip. We all got together at a local Tim Hortons donut shop in London Ontario. After coffees and a breakfast sandwich our trek started off down the Queens Highway # 401. About two and half hours later we finally arrived at Waterdown, Ontario. The swap meet and car show is located at: Joe Sams’ Park, 752 Center Road, Waterdown, Ontario. This was a two day event starting Saturday May 29 till Sunday May 30, 2010. I have been to this event many times over the years and have found many good parts for my hot rods not to mention the great cars that are on display. This year I only purchased a variety of flap wheels to finish polishing my aluminum TPI injection manifold for my 1987 Corvette convertible. These will be great to use also on my 1929 Ford Model A hot rod, especially on the aluminum C4 Corvette suspension parts. The link for more information on this event is: http://www.waterdownswapmeet.com/ . The weather was great for an outdoor event. Below are a few videos of the event we attended. The first one shows us driving in Jims 37 Chev, arriving at the fair grounds and getting parked.